It is a violation of Federal law to use this product in a manner inconsistent with its labeling. SHAKE WELL BEFORE EACH USE. Hold can upright. Test inconspicuous sample of fabric or rug for staining before use. For residential use only. Avoid contamination of food and drinking water. All food-preparation surfaces and utensils should be covered during treatment or thoroughly washed before use. Remove pets and cover aquariums before spraying. Do not use on pets or allow people or pets to contact treated surfaces until spray has dried. Point spray away from people, pets and plants. Do not use as a room spray. Contact as many insects as possible with the spray in addition to thoroughly treating all parts of the room where these pests may hide. Pay special attention to cracks, dark corners, hidden surfaces under sinks, behind stoves and refrigerators, food storage areas and wherever these pests are suspected. The treatment lasts up to four months. 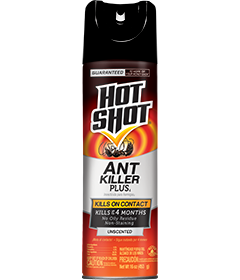 To kill ants†, treat doors, around window frames, ant trails and other areas of entry. Do not water the treated area to the point of runoff. Do not make applications during rain. All outdoor applications must be limited to spot or crack-and-crevice treatments only, except for the following permitted uses: Treatment to soil or vegetation around structures; applications to lawns, turf and other vegetation. Thoroughly spray infested weeds or bushy non-crop areas. To kill ants†, thoroughly wet hills and runways. For spiders and scorpions, carefully remove accumulated firewood, lumber and other materials where spiders and scorpions like to hide (be sure to wear work gloves). Treat beneath and next to the infested areas. When directly treating scorpions, stand at a safe distance and thoroughly cover the pests. Scorpions must be contacted by the spray to be killed. Store in cool, dry area away from heat or open flame. Do Not Puncture or Incinerate! CAUTION. Avoid contact with skin, eyes, or clothing. Wash thoroughly with soap and water after handling and before eating, drinking, chewing gum, or using tobacco. Note to Physician: Contains petroleum distillates—vomiting may cause aspiration pneumonia. This product is toxic to fish. Do not apply directly to water.